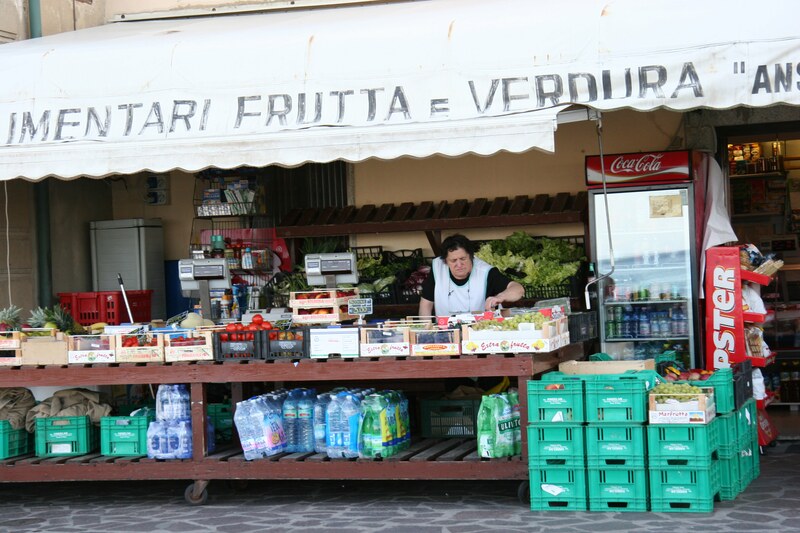 Editor’s note: Thanks so much to Barbara Kossy for her thoughts on this topic and for the great photos of Elba. 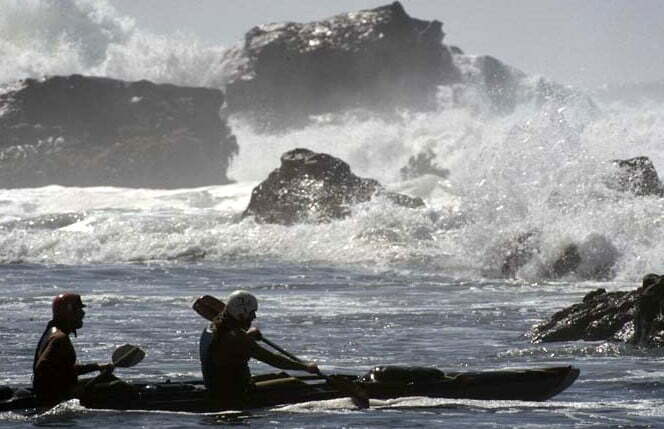 And thanks to her and to everyone I’ve paddled with at Pillar Point for all the great memories! Barbara: There’s an obsession with bucket lists, bagging peaks, hiking every mile of a trail, crossing a continent, as if life were quantifiable, and the only things worth doing are those we’ve never done. 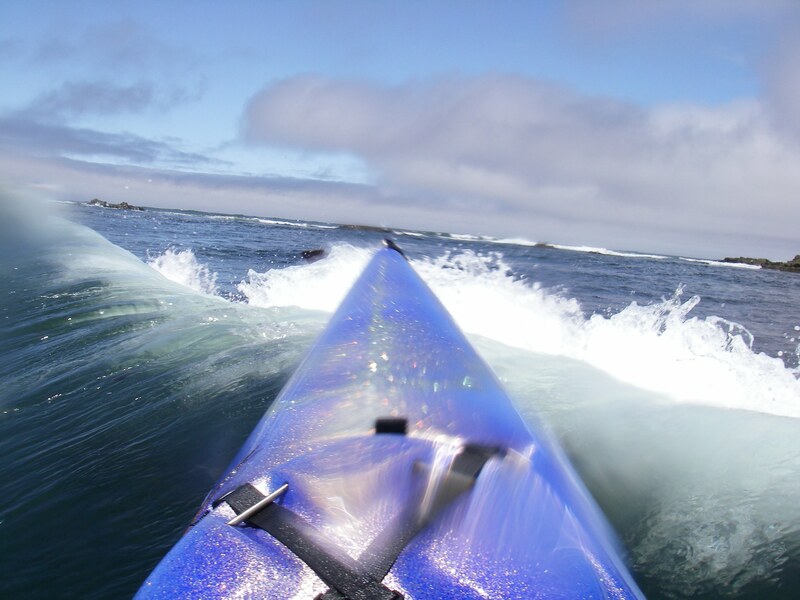 When I started kayaking I wanted to paddle everywhere, every mile of shore and every crossing. I’d get frustrated paddling the same old routes in San Francisco Bay, even with its more than 275 miles of shoreline. I wanted every trip to be a fresh exploration. Nancy: The advantages of paddling the same place over and again are huge. The place is always the same, but the experience is always different. Whether it’s an exotic destination like the Island of Elba or somewhere close by, it’s good to get to know at least one spot on our water planet really well. For me, it’s partly a safety issue: I feel safe at Pillar Point because even though my worst crashes and most startling experiences have happened there, I survived. Consequently I know all the bail outs, and because I’ve been there in all conditions I feel like just about anything could happen and I’d be able to deal. I started kayaking with Eric, and where he went I went, which at that time was mostly Pillar Point in Half Moon Bay and Sniveler’s in Moss Beach. 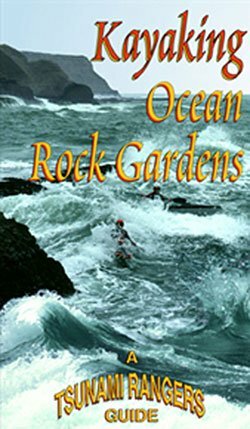 It was all surf and rock gardens, and I didn’t know how to handle either. I just wanted to live to see another day. Paddling the same place over and over, I got to know Pillar Point particularly well, and got to be a better paddler. 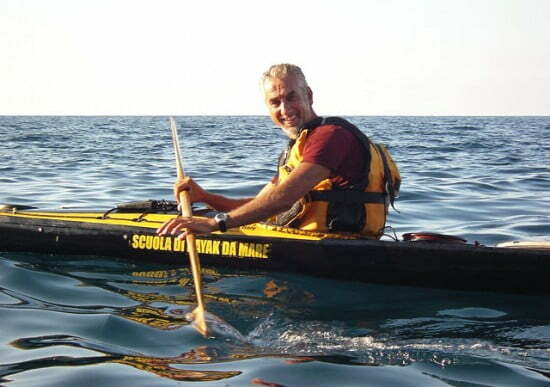 But when Barbara started kayaking she took off for foreign shores, travelling to the island of Elba where she met Gaudenzio. Barbara: Gaudenzio—when we first met in 1996 I saw him as remote, handsome, married, and aloof. And my Italian was rudimentary. I thought he was a snob. I was wrong. How could I have known we’d be friends for 19 years? He later told me he had been shy, not wanting to bother me because he didn’t speak English and he didn’t want to embarrass himself. They said, “Gaudenzio will take you around and show you the island by land and sea.” Oh no, I thought. This will be bad. But it was the start of an enduring working relationship. I explained how Americans like to have maps and have a pre-trip briefing, and he showed me how to debone a grilled sardine. He taught me the Italian for spray skirt, paraspruzzi, and demonstrated his expertise at predicting squirrelly Mediterranean weather. Flash forward two decades and dogs were bigger breeds. The chandlery sold mostly clothing and there was new gelato place that was really local and organic and great. 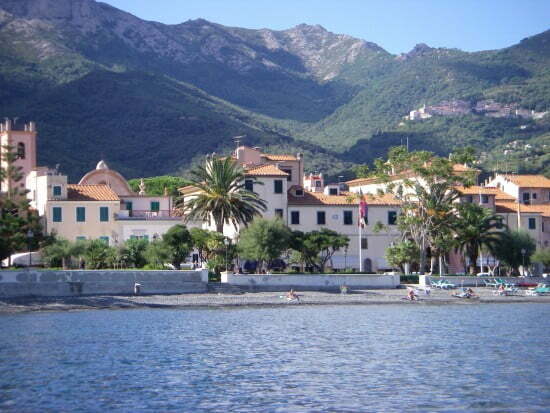 As I walked the embarcadero road by the harbor in Marciana Marina on Elba, I was sure I was on a Star Trek holodeck. 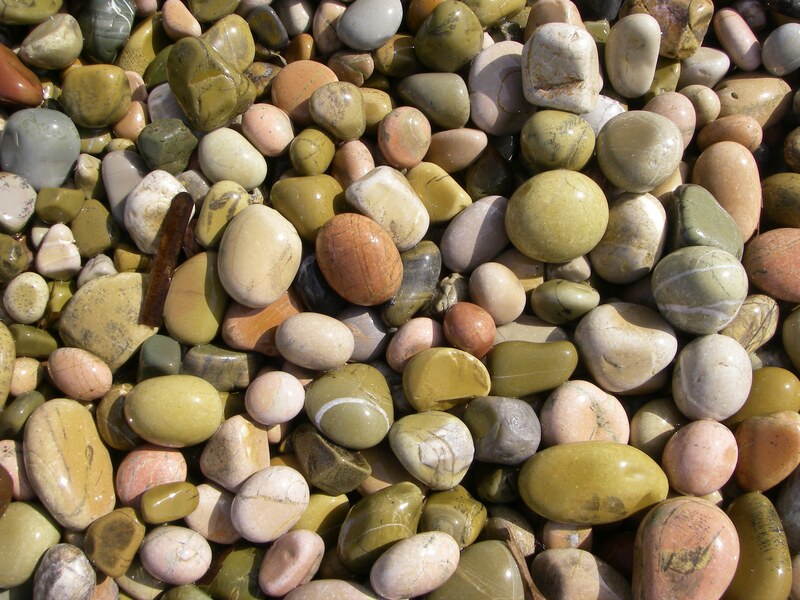 The sun warmed sea washed beach stones. Twisted tamarisk trees lined the street, the same fruit and veggie vendor opened her shop. Aldo, from the fancy restaurant up the street now managed the hotel dining room. The same, but different. 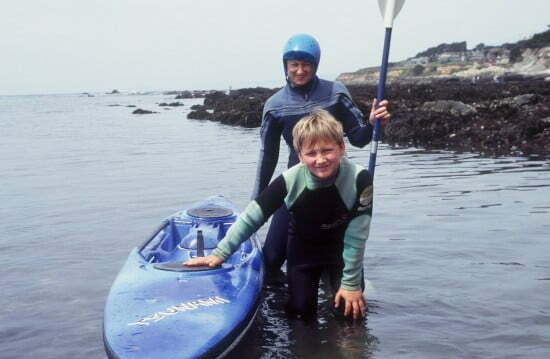 Nancy: Back in California, the last time I was at Pillar Point, I introduced my partner, Robert, to kayak surfing. 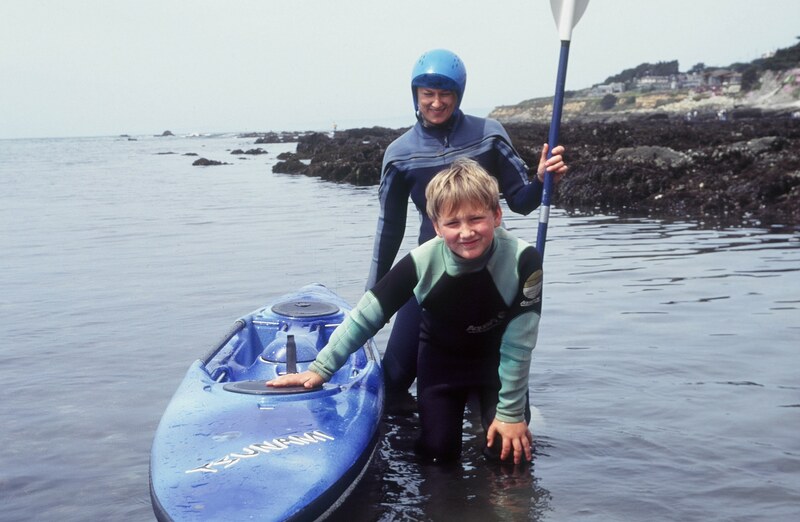 I thought Pillar Point would be a great place for Robert to experience more active conditions. I felt comfortable taking him there since the harbor makes for a safe spot to launch and land, the jetty provides protection on the paddle out as well as a fun place to ride the swell, and the lagoon provides a safe place to encounter waves and currents, reef and rocks. And then there’s surfing, which can happen any number of places depending on the day. 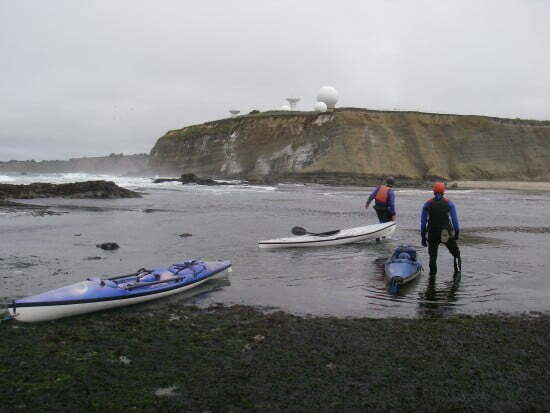 The Tsunami Rangers on Microwave Reef at Pillar Pt. Barbara: Half Moon Bay isn’t half of anything. 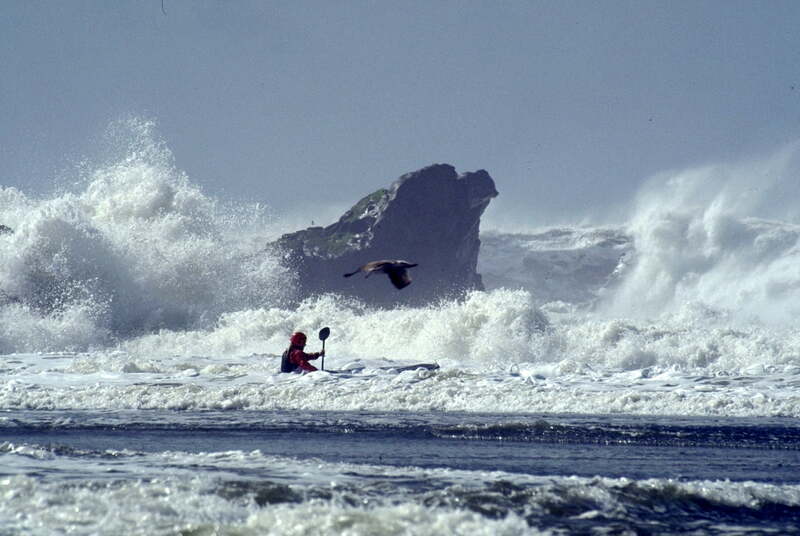 For the past 18 years I’ve done most of my paddling in one ever changing place, Half Moon Bay. When I first moved here I’d head off on solo adventures to Drake’s Estero, Tomales Bay, Monterey Bay, Elkhorn Slough. Eventually, I moved my kayak to the waterfront Half Moon Bay Yacht Club. Car topping was no longer required. I became lazy. I dove deeper into my local waters. 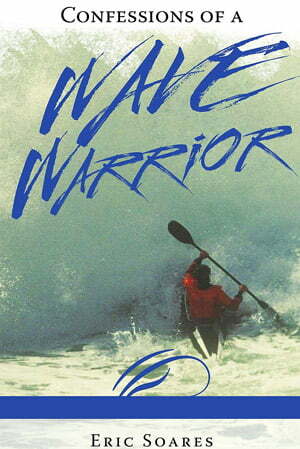 Launching regularly from the same beach I met local paddlers and we developed a regular weekend paddle. We explored the same waters every week, learning the reef configurations in high and low tides, in calm and not so calm conditions, in fog and rarely heat, through bird migrations and feeding frenzies, red tides, and jelly fish blooms. Sometimes the adventure of the day was the expanse of the connection with my paddling companions through recountings of divorces, romantic interludes, investment opportunities, baby’s first steps, empty nests and addiction recovery. We sighted mola mola, blue whales, Pacific whitesided dolphin, porpoises, sea otters, Steller’s sea lions, California sea lions, fur seals, minke whales, and humpback whales. Swimming pile worms, dense flotillas of jelly fish, comb jellies, leopard sharks, bat rays. Rare birds including brown booby, horned puffin, and there was the day a hummingbird buzzed by a mile off shore. Flocks of shearwaters, common murre dads with their chicks, diving brown pelicans, so many birds. Mining the depths of familiarity. 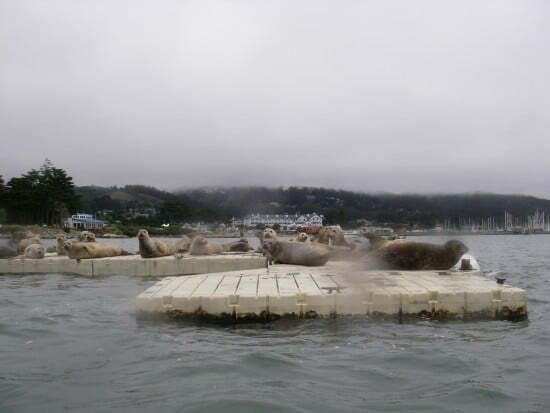 Nancy: I love the expansiveness of Barbara’s experience both in Elba and at Pillar Point. 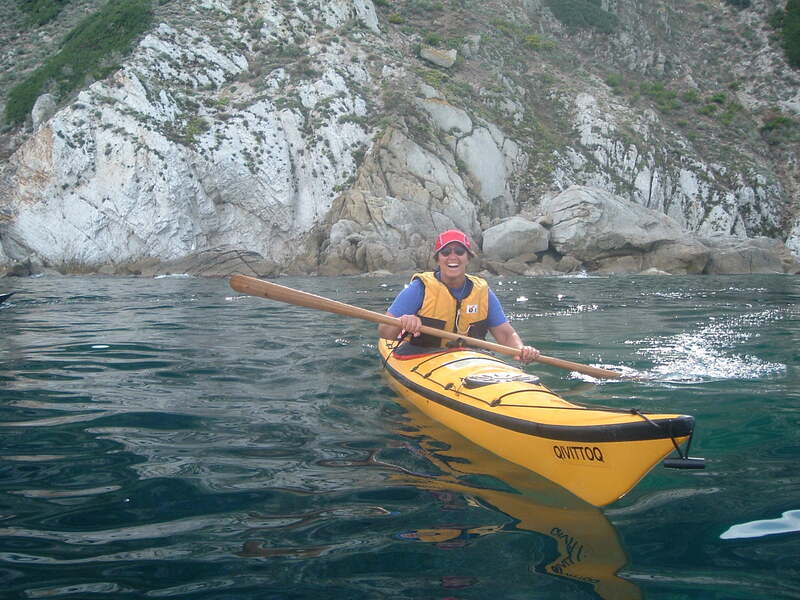 She’s paddled both places extensively and gotten to know them well. She’s also formed a cadre of kayakers with whom to paddle. My own kayaking experience has been more circumscribed. I’ve always paddled close to shore and mostly in active conditions and so I’ve never seen the whales or the mola mola at Pillar Point, although I’ve encountered plenty of seals, birds, and once even a surfing porpoise inside Mushroom Rock. Loving a flat day at Pillar Pt. This, for me, is a typical day at Pillar Point: the launch is always easy at the Yacht Club. Then there’s a nice little warm up paddling to the spit, where you can portage to the lagoon, or around the jetty to the same spot. Along the jetty I like to stay as close to the rocks as I can, allowing the swell to sweep me up and down and get a feel for the ocean. At the Point, I like to stop and observe the conditions for a while, usually just hanging off the end of the jetty. Where is the break? 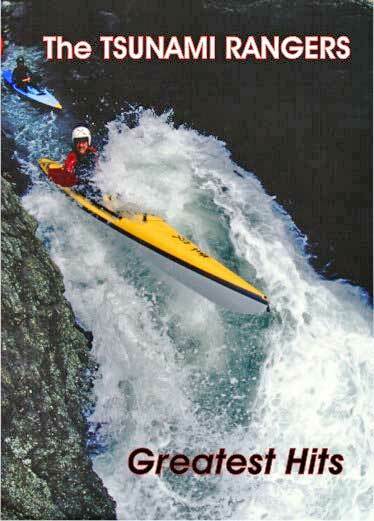 Are there surfers or other kayakers? How exposed is the reef? 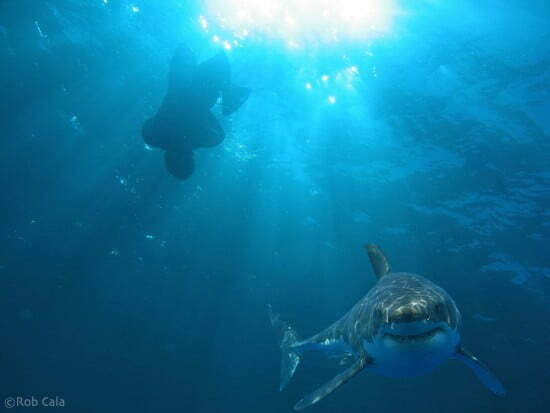 White shark by Rob Cala. They are out there. Another thing I like to do is get up close to the rocks. It’s fun to get right up to Mushroom Rock, point the boat’s bow into the rock and practice holding position as the waves wrap around the column. 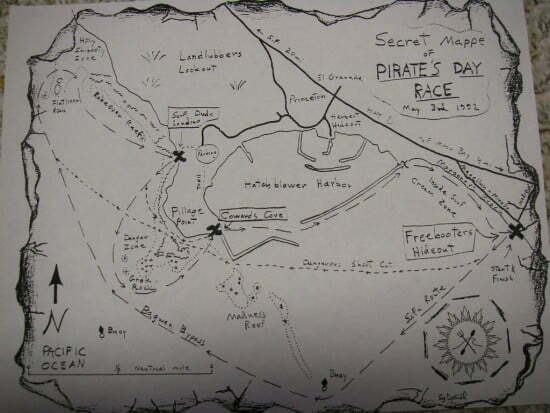 There’s also the nefarious Slot, where you can practice running in and out if you’re brave, or if conditions are too gnarly, just point your bow out to sea and hold position. You can paddle all over the reef, practice breaking the wave barrier, and practice take-offs and landings on the beach. The beach is great for taking a break and having a snack. You can also paddle around the Point to Ross’s Cove, where you can find more surfing, in addition to the Boneyard (a place to avoid). Around the corner is also Flat Rock, where there’s still more surfing, and a big channel through the middle of the rock you can paddle through from end to end. Click on the above link to see the Neptune’s Rangers adventures at Flat Rock in fine video form and some great photos of Mushroom Rock and surfing. 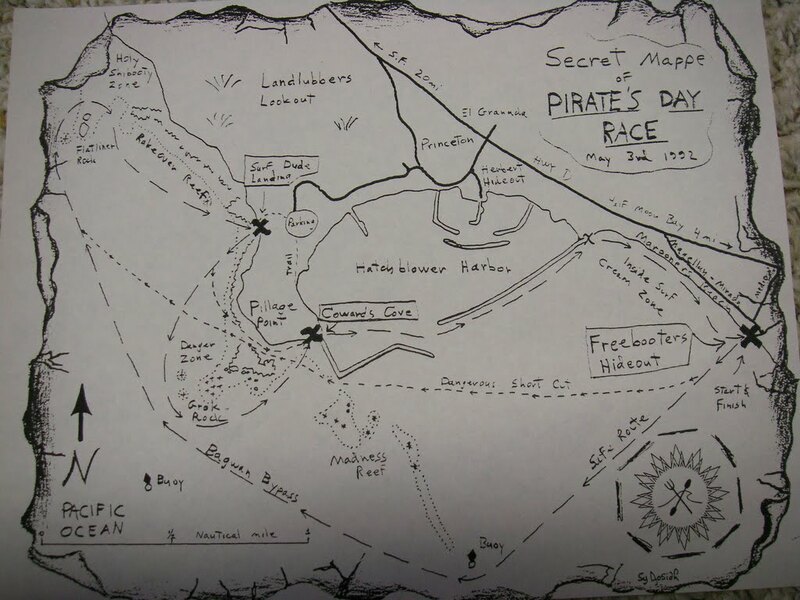 Back when I was prepping for the Sea Gypsy Race my buddy Denise and I went out to Pillar Point at least once a week for eight months straight. We went out regardless of conditions; we didn’t even bother to check them. Our philosophy was that we didn’t know what it would be like the day of the race and we had to be prepared for anything. 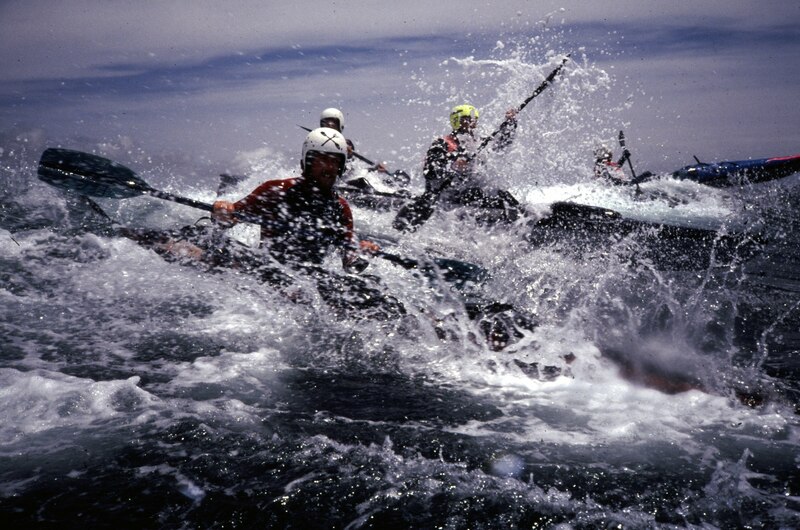 One time conditions were so rough we could barely stay in the kayak. We spent about 45 minutes swimming around by Mushroom Rock, repeatedly flipping the Tsunami X-3 and scrambling back in. I thought a lot about sharks that day. Another time it was so windy we had to paddle bent nearly double, paddles held flat to reduce wind resistance as we thrashed our way back across the harbor to the Yacht Club. 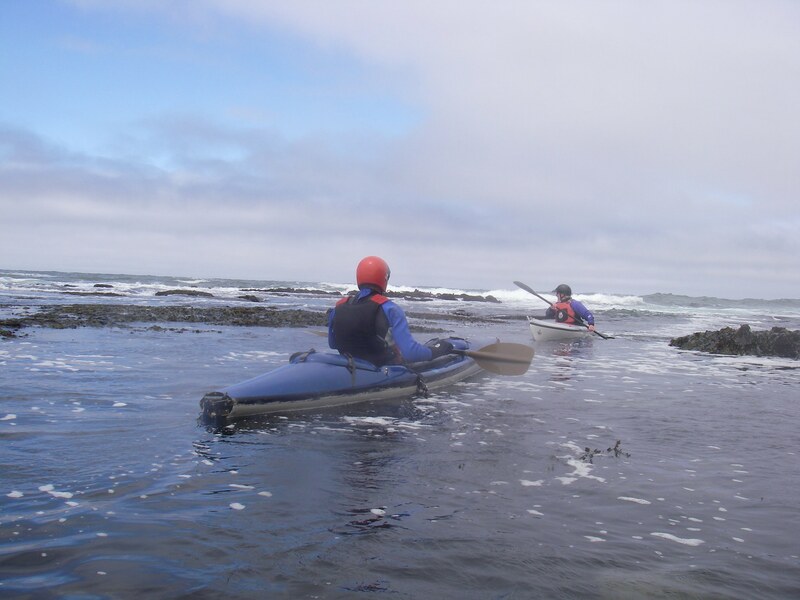 Wind, waves, kelp beds, rocks, surf, and wildlife, Pillar Point has it all! Eric and a buddy in the X-2 at Pillar Pt. Both Barbara and I have learned to love the practice of kayaking the same place again and again. Barbara spreads it around by going to the Mediterranean each year and is rewarded by getting to know amazing people, making friends wherever she goes. She also gets to know the wildlife really well. I on the other hand have kept closer to home, and my circle of paddling partners is small, but over time I’ve come to know Pillar Point intimately. 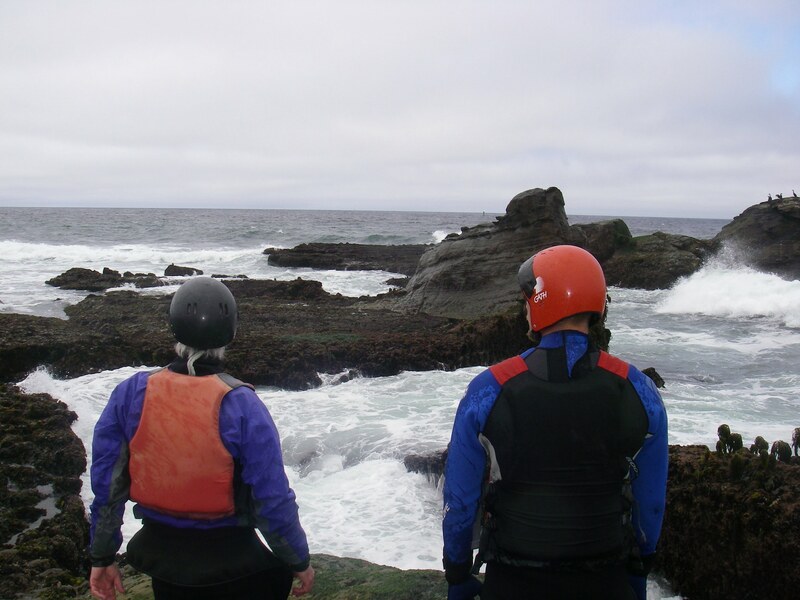 That place literally taught me almost everything I know about sea kayaking, and I’ll never get tired of going back. Here’s a webcam for Half Moon Bay with a view of the harbor and over the breakwater to the ocean. I know some of you have great Pillar Point stories. Please share your adventure below!